Common Defenses in a Florida Slip and Fall Case | Law Office of Andrew G. Rosenberg, P.A. You know what happened. You slipped, or tripped, and fell on someone else’s property because there was a dangerous condition there that caused the incident. Your injuries weren't your fault. Yet the insurance company or the property owner’s lawyer doesn’t want to provide you with a fair recovery. Instead, they're putting up a defense to your claim. You need to be prepared for their arguments so you can present evidence and arguments that prove the property owner's liability. The condition that caused you to fall was open and obvious. Florida property owners don't need to warn you about risks that you should recognize on your own. For example, if an area is clearly under construction and you entered that area when a reasonable person would have known there was a risk, then you may not be able to recover damages in a slip and fall lawsuit. You knew of the condition and assumed the risk. If you proceeded after you were either warned about a certain risk or the hazard was open and obvious, the defense may argue you assumed the risk and any resulting injury was your fault. The fall was your fault and not a problem with the property. You cannot sue a property owner if you fell because of an untied shoelace, a medical condition, or something else unrelated to the property. The defendant didn't control the property at the time of your fall. This defense generally comes into play when it's a landlord-tenant situation. If the property owner didn't have control over the property, but the tenant did, then it may be the tenant who's liable for your injuries rather than the property owner. The defendant didn't know, and shouldn't have known, about the dangerous condition prior to your injury. Property owners are only liable for dangerous conditions they actually knew about or should have known about. If the dangerous condition was new or wouldn't have been discovered by a reasonable person, then the property owner may not be liable. You can be prepared for these defenses. 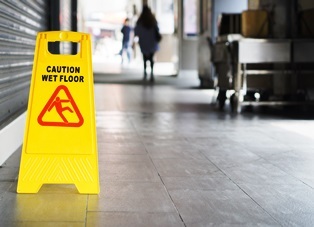 Your legal team will investigate your slip and fall accident and gather the evidence to prove what happened and hold the defendant liable for your injuries. Then, your lawyer can make the necessary arguments to the insurance company or to the court to protect your fair recovery. Please contact the Law Office of Andrew G. Rosenberg, P.A. today to schedule a free, no-obligation consultation about your rights and potential recovery.